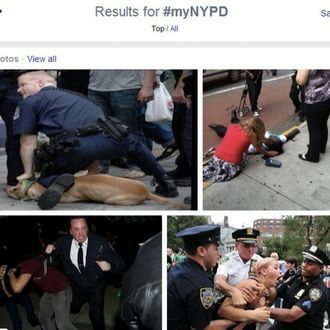 On Tuesday, whoever is in charge of the @NYPDnews Twitter account invented #myNYPD, a hashtag for people to post feel-good photos of themselves interacting with cops. As you may have noticed, the effort backfired on the department, with Twitter users mostly deciding to share images and stories of police brutality and other misconduct. (At one point, over 10,000 people per hour were posting under #MyNYPD, which eventually overtook #HappyEarthDay as a trending topic.) While many might argue that anyone paid to hang out on social media should have seen this coming, “sources” felt compelled to tell the New York Daily News that no one will be disciplined over the fiasco. Meanwhile, the department put on a brave face: “The NYPD is creating new ways to communicate effectively with the community,” said spokesperson Kim Royster. “Twitter provides an open forum for an uncensored exchange and this is an open dialogue good for our city.” At a Wednesday press conference, police commissioner Bill Bratton said that the NYPD will continue its effort to solicit pictures from the public. “If anything I kinda welcome the extra attention,” he said. Asked about the photos they already had, he explained, “Often times our activities are lawful, but they look awful.” At least he knows what he’s dealing with.